In 1963, Comptons introduced the '363' model which was to replace the now technically out of date 347. The 363 had the advantage of the 12 electrostatic tone generators housed within the console as opposed to an external cabinet. Many 363 models can still be found with one example being St Cyprian Church in Hay Mills, just outside Birmingham city centre. The organ was installed in the late 1960s to replace a Bryceson pipe instrument. The console has been installed in the same place as the pipe organ console and this particular instrument features another fascinating Compton patent - the 'rotofon' speaker which stands in the old pipe organ chamber. One of the limitations of an electric organ that relies on a single set of tone generators, regardless of whether they are electronic or electromechanical, is that all the sounds of any pitch are locked together in phase. This situation never obtains in practice with a pipe organ however well it is tuned, resulting in slow beats that give ‘life’ and richness to the sound. Many builders of electric organs have attempted to simulate this effect either acoustically or electronically to disguise the ‘thin’ and unnatural tone of their locked-phase generators, because it was much cheaper to do so than to provide more generators. One method widely used before the advent of digital signal processing was to rotate some part of the loudspeaker system, by which means the amplitude and phase of the high harmonics in the sound could be subtlely modulated. Either the drive units themselves or a sound-deflector placed in front of them can be rotated, so long as the acoustic coupling between the speaker and the room is continuously changed. 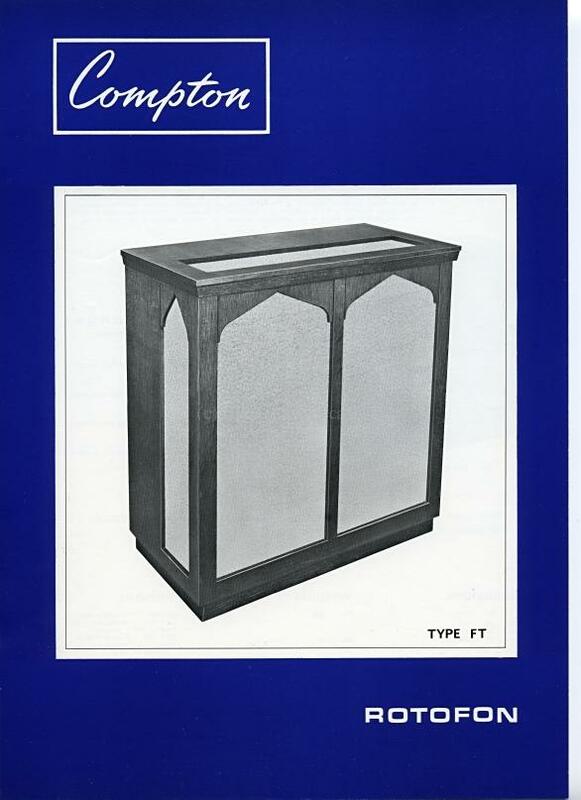 Typical speeds range from 5 to 12 rpm, equivalent to the popular ‘Leslie’ speaker on its Chorale setting. Higher speeds typified by the Leslie Tremolo mode are unnecessary for classical instrument specification, since a much gentler tremulant effect was normally produced within the organ itself. The revolving-drive-unit principle was adopted by Compton in their ‘Rotofon’ speaker, added as an extra to the Electrone range during the 1960s and increasingly supplied with consoles that required an external speaker system such as the 357 and 363. All Rotofons were of similar construction and size, 4 feet (120cm) square and 2 feet (60cm) deep. Two styles (traditional and modern) were offered with a choice of wall-mounting or free-standing construction, in the same range of wood finishes as the consoles. One Rotofon was sufficient to handle the output of a single organ amplifier chassis; more amplifiers and Rotofons could be added if required to fill a larger building. In 1966 Comptons were financially wound-up and a new company 'Compton Organs Ltd was formed. They continued up until 1969 to produce electrones and carried the nameplate 'Compton Organs Ltd' as found on the organ here at Hay Mills.